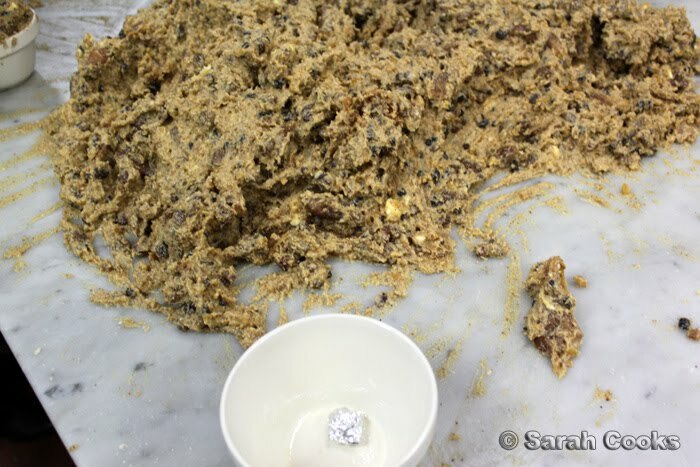 Let's all take a look at that magnificent pile of Christmas pudding dough! You all know I love Christmas, yes? I love the presents, I love the turkey lunch, I love the Weihnachtsgebäck, I love the mince pies, I love the Christmas cake, I love the post-Christmas barbecues, I love it all! 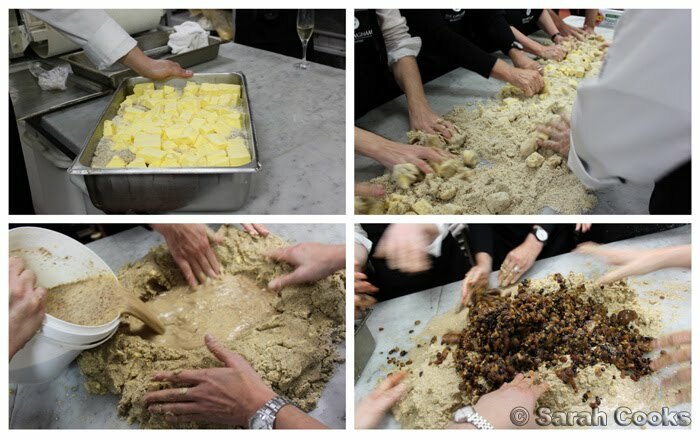 I especially love Christmas pudding, so I was very excited to be invited along to The Langham's "Christmas in July" pudding making class tonight. Even though we did end up elbow-deep in pudding mixture, the night started off quite a bit more sedately, so let's begin there. We arrived to a very warmly decorated function room upstairs, enjoying champagne and some beautiful canapés. There were quite a few more on offer than the 6 I photographed below - did you know it's really, really hard to eat and photograph at the same time? Traybound food is especially hard because it keeps moving! (I must have gotten out of practice ever since Sandra took over the bulk of the photography for my blog. Oops. Must practise more!) 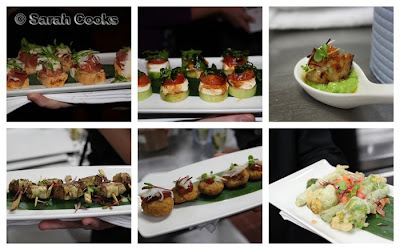 Sandra didn't attend tonight's event, so these photos were all me! 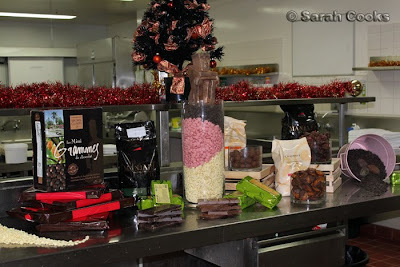 Beautiful chocolate display - it was fantastic to have a closer look at the chocolates they use in their Afternoon Tea. I love the presentation... mmm... a river of chocolate callets. 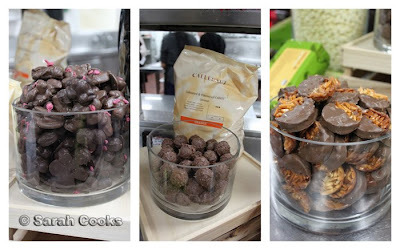 There were also a few treats on offer, and you may remember the granola clusters (left) and the florentines (right) as 2 of my favourites from the afternoon tea. Fab! 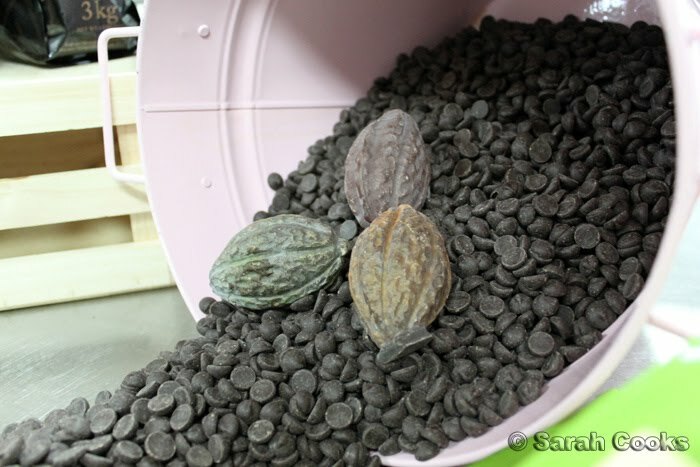 Down here, Pastry Chef Zara showed us how to temper chocolate and dip truffles. 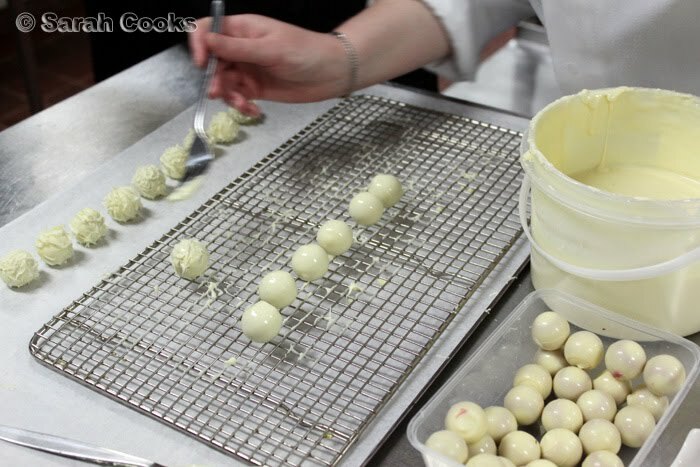 The first truffles were white chocolate filled with elderflower liquer and raspberry ganache, and Chez Zara got some very funky patterns on the white truffles by rolling them along the rack with a fork! So simple and effective. 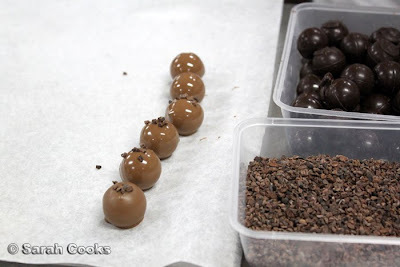 These ones below were rum truffles dipped in Lindt milk chocolate and topped with cocoa nibs. 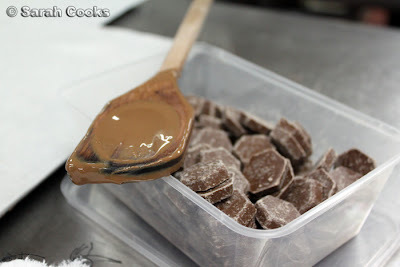 Can you see how the truffles become more matt as the chocolate cools down? Wait a minute... did someone say Lindt milk chocolate? Lindt milk is my favourite chocolate of all time! I love how smooth and caramelly it is. I used to buy the piccoli (i.e. the little hexagonal pieces of couverture) in the 2.5 kilo bags. I've stopped doing that now, probably for the best. The Langham's pudding is both gluten and suet-free, to fit in with modern dining sensibilities. (I am definitely not in the anti-suet brigade though!) 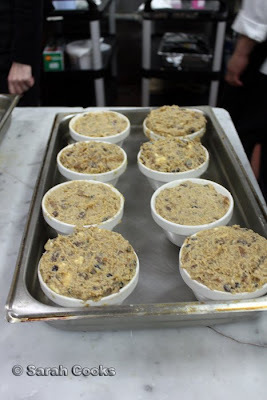 We started by rubbing both almond and hazelnut meals into the butter, then added a heady mix of spices, eggs, citrus juice and zest, Guinness and milk. Finally, he tipped in a mixture of dried fruits (including whole figs), that had been macerating in St Remy brandy. The smell was incredible! 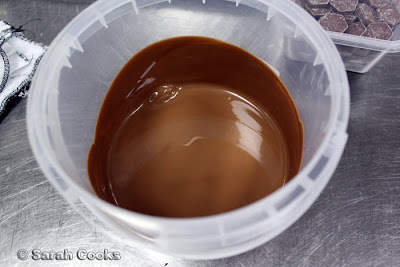 As you can (just) see in the top picture of this post, we each got a little charm to put in our puddings, which was wrapped in foil, and covered in pudding mixture. The chefs at The Langham are going to cook and store our puddings, and we'll get them at Christmas. The mixture was quite light in colour and the texture was quite fine compared to my usual Christmas pudding. I'll be interested to see how it turns out come December! If the taste of the raw dough is anything to go by, I'm sure they'll be fabulous. Sarah attended Christmas in July as a guest of The Langham hotel. That was such a fun night. 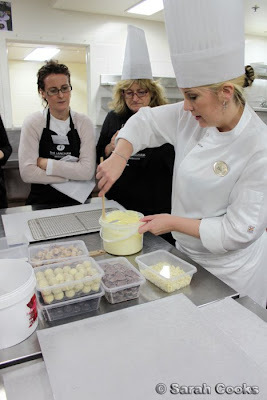 The chocolates were so delicious and I loved squishing the pudding dough, so cathartic. I loved your one hand technique squishing dough and taking photos at the same time. Good job in taking those photos Sarah! Wahhhh I'm salivating just looking at the photos of chocolates. I recently bought a 2.5kg bag of Lindt dark chocs haha. Oooo shall wait to see your pudding in 5 months' time hehe!!! I never realised there was an anti suet sentiment. I say bring it on. These puddings look great, I would happily have one at Christmas time. Ah what a good night! Great photos, I fear mine are going to be very average! Can't wait to see what they tasted like! omg looks amazing! cant wait to try it in december.. i miss christmas! and props for the one- handed photography! I want some of everything. Next time you need a photographer, let me know Thanh knows how to contact me. hehe. That looks like lots of fun. Great photos too.